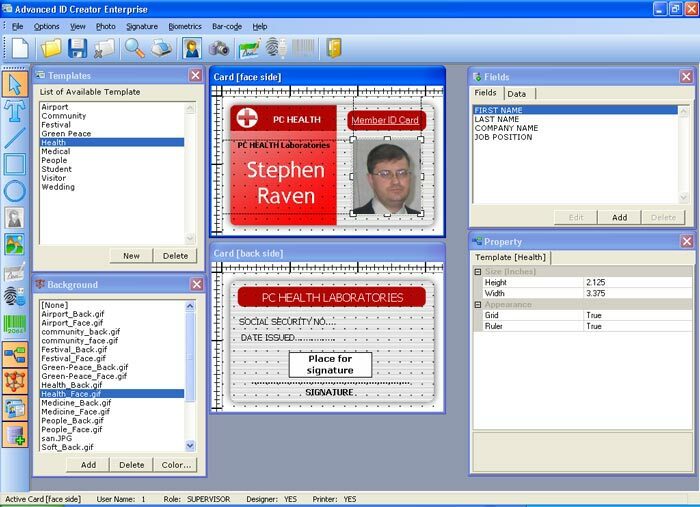 Advanced ID Creator Create and print professional ID cards and badges instantly! Advanced ID Creator allows you to create great looking id cards.Use the wide variety of tools to add text, graphics, shapes, barcodes, shadows and other effects to your design. Use the previously saved template to get started in a matter of seconds. Once your basic design is created tweak it or print it just the way it is.Create you own ID cards and badges in minute. ...... Vary the color and style of any object for an endless array of possibilities. Have you seen your desktop's dye dissolving? Download now and watch it yourself. Qweas is providing links to Advanced ID Creator Enterprise 8.22.185 as a courtesy, and makes no representations regarding Advanced ID Creator Enterprise or any other applications or any information related thereto. Any questions, complaints or claims regarding this application Advanced ID Creator Enterprise 8.22.185 must be directed to the appropriate software vendor. You may click the publisher link of Advanced ID Creator Enterprise on the top of this page to get more details about the vendor.